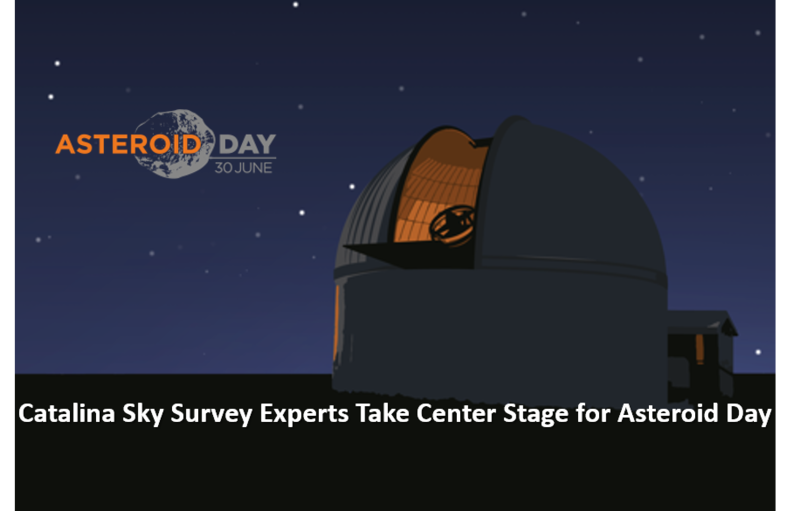 As a world leader in near-Earth asteroid discoveries, it's no surprise that Catalina Sky Survey (CSS) is a prominent participant in this year's Asteroid Day activities. On Tuesday evening June 27th, the Catalina Sky Survey's Principal Investigator, Eric Christensen was one of five asteroid-expert presenters from the University of Arizona's Lunar and Planetary Laboratory. Speaking to the audience at this sold-out event, held within the expansive dome of the Flandrau Planetarium on the campus of the University of Arizona, Christensen described what asteroids are, the relative threats that near-Earth asteroids (NEAs) pose to earth, and how the Catalina Sky Survey scans the night skies for new NEAs. Also taking part in the presentations were key scientists from the OSIRIS-REx asteroid sample return mission, including the Lunar and Planetary Lab's Dante Lauretta, principal investigator for the NASA-sponsored mission, and Professor Vishnu Reddy another expert asteroid researcher from LPL. The multimedia presentation was filmed and will be globally re-broadcast on the official Asteroid Day, June 30th. In Addition, Catalina Sky Survey observer Rose Matheny will be featured in an Asteroid Day live interview as she actively searches for NEAs from the University of Arizona's Mt Lemmon Observatory north of Tucson. See the Asteroid Day schedule.